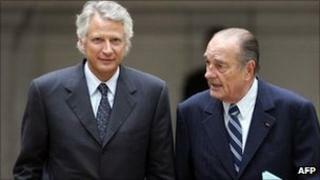 French ex-President Jacques Chirac, and presidential hopeful and former PM Dominique de Villepin were given $20m by African leaders, partly to finance election campaigns, a lawyer alleges. Robert Bourgi said he was personally involved in handing Mr Chirac briefcases full of cash, but said there was "no proof" of the payments. Mr Bourgi made similar allegations against the far-right politician Jean-Marie Le Pen, AFP reports. The ex-leaders vowed to sue Mr Bourgi. Mr Chirac and Mr de Villepin deny the claims, which come seven months before presidential polls. Mr Le Pen said the allegations against him were "false... ridiculous". Mr de Villepin is seen as a major centre-right rival to President Nicolas Sarkozy. Mr Chirac is currently on trial in absentia on charges of illegal party funding. A medical report says he is too unwell to attend and suffers memory lapses. In an interview for the Journal de Dimanche newspaper on Sunday, Mr Bourgi alleged that he had been involved in handing over several suitcases to Mr Chirac during his tenure as mayor of Paris in the 1980s and 1990s. He claimed that the suitcases always contained at least 5m francs ($1m; £630,000) and sometimes as much as 15m. The first handover of money in Mr de Villepin's presence occurred in 1995, he said, involving 10m francs from the then Zairean President Mobutu Sese Seko. Mr Bourgi alleged that money from the leaders of several former African colonies was then passed to Mr Chirac and Mr de Villepin over the next 10 years. Speaking on Europe 1 radio, he estimated the total amount to be about $20m. But he added there was "no proof, no trace" of the alleged secret payments. In an interview with French television on Monday, he also alleged that the former head of the far-right National Front party, Jean-Marie Le Pen, funded part of his 1988 presidential campaign with money from Gabon's late ex-president Omar Bongo, AFP reports. Mr Le Pen told BFM television: "If this Mr Bourgi was charged with giving me these funds, he must have kept them for himself." Mr Bourgi claimed that Senegalese President Abdoulaye Wade, Burkina Faso's Blaise Compaore, former Ivory Coast President Laurent Gbagbo, Republic of Congo President Denis Sassou Nguesso and Bongo all visited Mr de Villepin in his office, handing over $10m for the 2002 election campaign. Bernard Houdin, an adviser to former Ivory Coast president Laurent Gbagbo, said that such payments were "a historical practice" and that "the sums mentioned are no doubt below reality". However, Sengalese and Burkinabe officials denied the claims. Asked what African leaders got in exchange for the money, Mr Bourgi said: "Lies, lies, lies, unkept promises, meaning that France would close its eyes to certain abuses of power in Africa." "I acted in my own name, no-one dictated me this interview," Mr Bourgi said, adding that he wanted a "clean France". He added the claim that the same system of secret payments existed under former presidents Georges Pompidou, Valery Giscard d'Estaing and Francois Mitterand. Mr Chirac's lawyer, Jean Veil, said on Sunday that he had been instructed to file a defamation complaint against Mr Bourgi, and Mr de Villepin told French TV he would do the same. "They are trying to stop me from running [for president], they have been putting spokes in the wheels for years, but I have thick skin," he said. Judges are expected to rule this week on the so-called Clearstream affair, in which Mr de Villepin is charged with plotting to discredit Mr Sarkozy by failing to stop a corruption inquiry in 2004. The former prime minister was cleared of all charges in a trial that ended last year, but the state prosecutor appealed against the verdict. Mr Bourgi is widely seen as being close to Mr Sarkozy, but he said he was not an unofficial or official adviser, although he was sometimes consulted by the president.